Happiness Guaranteed! MapifyPro is an elite store locator plugin for WordPress that adds maps with dozens of incredible features. See the demo & included features below. $19 /mo Normal License Billed monthly. For use on a single website & test environment. Support plan & free updates included. $39 /mo Developer's License Billed monthly. For use on UNLIMITED websites. Support plan & free updates included. Complete control over your Maps! This store locator plugin comes with features that are simply unmatched, and truly unlimited. 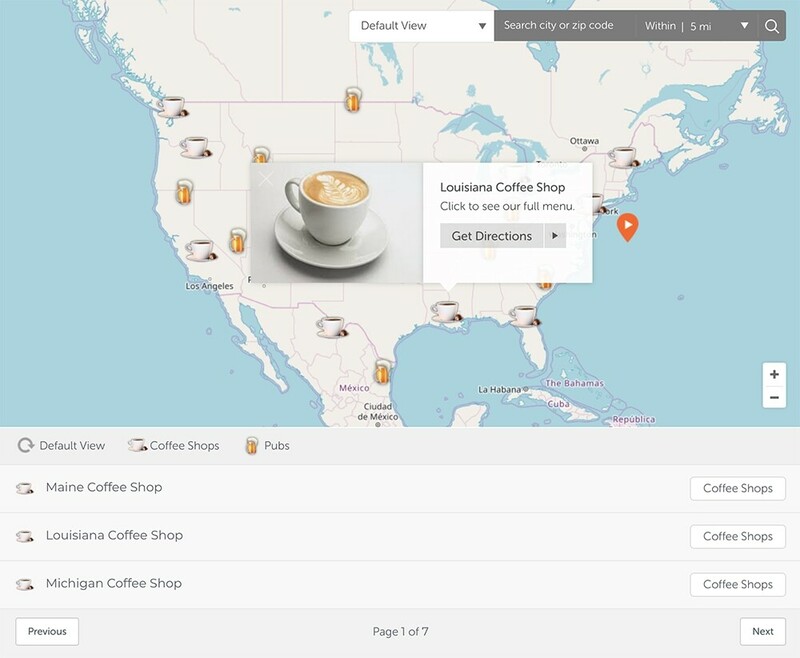 Place as many maps as needed throughout your site, each with their own specific settings, and build a library of accessible, search friendly locations. Simply put: MapifyPro is the most powerful mapping plugin for WordPress, period. Your purchase also includes our premium tech support plan! Create Maps Using ANY Image! Though MapifyPro allows you to have full control over standard Maps, sometimes you need a very specific image to be used for a map. Whether it’s a park, a convention, or even a video game map (We use the same tech as the maps on IGN), MapifyPro lets you use ANY image for your map while maintaining the feel of Google Maps for WordPress. Nearly all of MapifyPro’s features carry over to the image maps too, even zip/city search! In other words, you get complete control over any map. Create as many maps as needed, each with their own style, locations, and behaviors. All maps are stored in a familiar library, and assigned a unique shortcode for easy placement. Include all of your locations beneath the map in an interactive list. Clicking will expand to show more info, and highlight the location on the map. It’s the perfect compliment to any map. Every element of MapifyPro is fully responsive, ensuring that your users view the maps properly from any device. It is also optimized for touch devices! *Not: your theme must be responsive too. Categorize map locations to ensure the best experience for your visitors. The dropdown filter lets you group locations under any category, making it simple to find specific types of locations. Add as many unique map markers as needed. Assign a default marker image, or mix and match different markers for all locations. We include over 200 free icons to get you started! Add a video and photo gallery to any location as needed. Highlight food photos for restaurants, fun times at the local pub, or vacation memories on the spot where they actually occurred. Share specific locations on Facebook, Twitter, Pinterest, and more and drive traffic directly to your map with the location highlighted. Create viral marketing maps and boost your traffic! Harness the renowned SEO power of WordPress: Each location’s details are crawled by search engines, keywords are utilized, and each location integrates with popular SEO plugins like Yoast. If you have a lot of locations, you can enable the cluster feature to group nearby locations into a single icon. When clicked, they expand to show the locations contained within. A must for Travel Bloggers! MapifyPro integrates directly into blog posts. 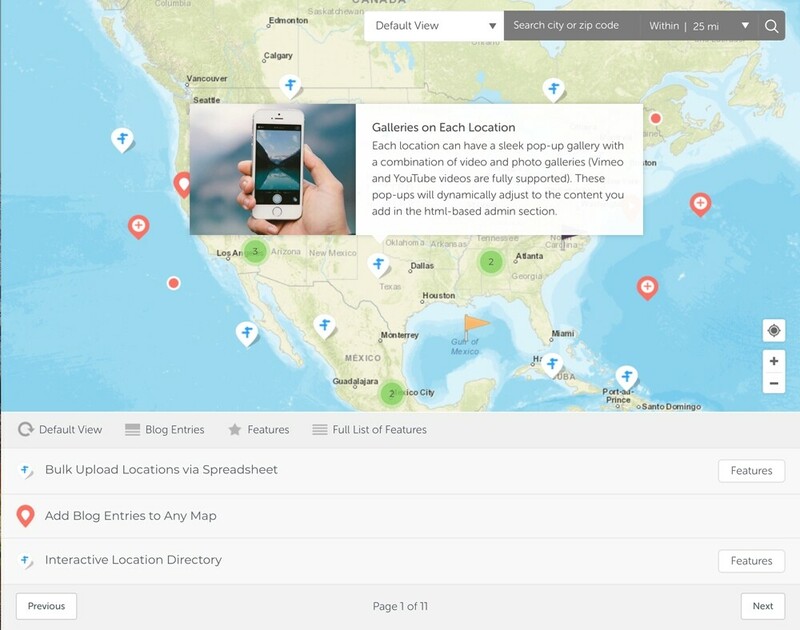 Add entire articles to any map directly on the location of interest. Perfect for restaurant reviews, hiking tours, & more. Toggle the option for animated tooltips and/or pinpoint markers. This adds an extra layer of sleekness to your maps to ensure that you feature the most modern presentation available. MapifyPro’s powerful search engine will find locations within a specific radius via city or zipcode. However if no locations are found, it will suggest the closest location to the user. MapifyPro offers multiple ways to filter location results. This feature adds an interactive map legend that also serves to filter locations by category on the map itself. Find locations fast! 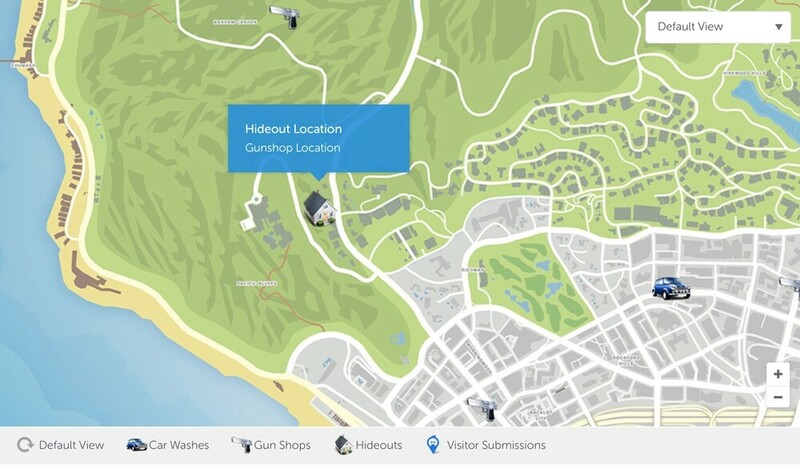 Provide locations to any direction on your map with a single click. If viewing from a GPS-enabled device, our maps will also provide to and from directions via Google Maps to any location. Have a lot of locations? The Batch Upload feature allows you to add as many locations as needed via a .csv file. Upload once, and all locations are added to the map of your choice. MapifyPro comes with multiple pre-styled maps that allow you to achieve the perfect look in a single click. Every aspect can be customized! Customize not only the style of your map, but tooltip colors, gallery backgrounds, button colors, and other details. Match brand colors and more to match perfectly with your site design. MapifyPro offers multiple ways to link directly to any location on the map: Link directly to a location with all others filtered out, or link to the location with the full details expanded automatically! Though constantly updated to ensure utmost compatibility, as with any software, issues may arise. Our support team is here to help our members at any time. MapifyPro runs on the most cutting edge tech available. This means rock solid stability, beautifully written code, and modern effects. We are constantly updating MapifyPro with new features and security updates. Your subscription to our service means that you’ll always have thew best, most secure software available. Jason and Nikki Wynn are a couple of perpetual travelers, RV’ers (for now) and modern day documentarians. Gonewiththewynns.com is the home of their discoveries and adventures all depicting the unscripted tale of how they traded in everyday life to satisfy a wear-out-your-shoes sense of adventure. The Wynn's used MapifyPro to showcase all of their adventures. Their comprehensive map includes photos, video, and product reviews. Using the interactive filter list, they've organized tons of locations while keeping it organized and fun to interact with. 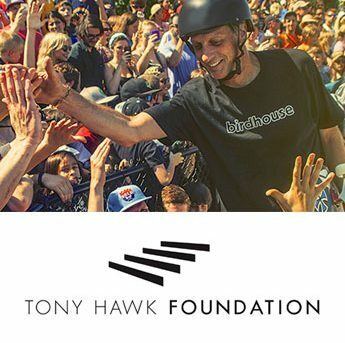 A personal childohood hero to our founder, Tony Hawk showcases perhaps our favorite example of MapifyPro. His foundation provides a safe haven in the form of skate parks for children across the country. Skateparks build and sustain healthy communities, and MapifyPro is proud to be part of this enriching program. The map clusters feature helps THF organize 560+ locations in an organized manner, making it simply to find a nearby skate park. From pull up bars to monkey bars, obstacle courses to pole climbs! MapifyPro and Muddy Plimsolls are helping London get in shape by charting every fitness destination around the city. Click through to see why their map is getting such rave reviews from their users. Muddy Plimsolls charts the best, free workout locations around London! Each location showcases a different workout spot, and it's rating, while providing a way for visitors to share the locations via social media. Their interactive MapifyPro map has garnered tons of great reviews (and new traffic) for their website. Cory Trepanier is one of those artists that I’m in awe of, and I’m equally enamored not only by mastery of oils, but by the fact that he creates these amazing images on location using MapifyPro. Cory Trepanier showcases his beautiful oil paintings on the exact location they were painted, fully completing his vision of connecting art and nature. PrettyRoutesPro allowed Cory to showcase a road trip, and when combined with MapifyPro, he documented his travels with photos and video journals. Super easy to use, inclusive, intuitive, and incredibly supportive with quick turnaround to queries. My company uses a competitor’s store locator for other products whose help desk is slow to respond and ridiculously defensive & petty to simple questions. Not so with Mapify Pro – they’re kind, considerate, quick, and helpful to get you on your way & onto the next project you need to finish. Mapify Pro is how a paid plugin should work – it rocks! So far so Good! We are in the process of setting up a map and connecting the stories of the children we help across Australia. I love the custom feature of being able to incorporate our own branding into the map. The import feature from spreadsheets is super handy and will help streamline our content into our new map. After trying many other map plugins, we found mapify pro. I wish we had tried it sooner. The plugin allowed us to create a ‘Markets’ page that allowed us to display stories and anchor to an interactive map. The plugin is quick and responsive. In addition, the support team is amazing! Highly Recommended!! Absolutely 5 stars on this one. In my 20 years as a website designer I have used multiple Map plugins, MapifyPro is hands down the best. No question. Not only does it have the best features and functionality, it’s absolutely beautiful and fits well into websites I have taken time to stylize. If you happen to need support, Josh on his team are quickly on the ball, going above and beyond to help – unlike other plugin companies I have used in the past. I tried every location map plugin there is and this is the only one that was easy to use, looks great and great support! Don’t bother with the others, THIS is the one! Looks beautiful, easy to implement and works with any theme. Hands down the best map plugin around! I tried 2 others before being fortunate enough to find mapifypro. I love how feature rich this program is as well as allowing you to really do an amazing job of making your map locations look good. There are so many choices as to how to make the listing look it makes it so customizable you would think it was custom built for your needs. Support has been outstanding as well. I had some issues with the batch uploader not working for me and the support team was outstanding in helping me solve the problem! As it turned out it was a formatting issue on my end but they took the time to help step by step to get to the bottom of what we had going on. Thank you to the MapifyPro Team for helping me with a bug unique to my site. Got me an early update to fix the bug and Josh’s customer service was great – awesome to deal with someone who understands the needs of the client and can hold a conversation (albeit an electronic one) while doing so. Mapifypro was exactly the solution we needed for our project. Our clients and their customers all love it. Support is awesome as well! World class! MapifyPro is a beautiful and easy to use maps and locator solution for wordpress. I do not think there is a better one out there. The one & only map plugin we ever use here for 4+ years now. Effective and fast support when we need it & very friendly but also highly customizable settings. Couldn’t be happier with MapifyPro! Josh went above and beyond in helping us find the right solution to custom code a global map. I appreciate his kindness, candor, and excellent customer service! He gave us a good deal and gave access to his development team to help our during the process. So thankful for him and his team! I had a client website with Mapify plugin already installed but we needed to upgrade it and support helped in like seconds. Can’t say how much I appreciate such friendly and fast support, I would give them 10 stars if I could. Great plugin! Well, just now installed MapifyPro plugin. Its amazing! Easy-to-use and good looking, definitely recommended to all fellow developers! This plugin will save a lot of Your time! Thanks for this awesome store locator, great job! P.S. Support is just cordial and instantaneous! Great product, flexible and powerful. Excellent customer service helping me figure out how to implement on my WordPress site, as well. After trying various map plugins and geo-directories MapifyPro works the best. First off, it’s responsive, has perfect SEO, and since so many people use it the plugins stay updated. The workflow of creating a map and locations is smooth and straightforward. You can embed a video on the popup windows of the map markers, along with pics and text. My site is a travel site and since I have a video on almost every map marker, people don’t need to leave the site to go to YouTube. I’m also using the PrettyRoutes plugin, to show people scenic drives they can take. One of the selling factors for me, compared to using a geo-directory plugin, was the ability to insert a map on each page of my travel site and then add as much copy and text below the map as I wanted. The popular geo-directories I used before wouldn’t let you add copy on the rest of the page, it was just the map and then the listings. If you know anything about SEO then you know that you can rank a page in Google for way more keywords if you have more copy on the page. So MapifyPro is amazing in that respect. And also, the support was great. The creator of mapifypro replied to me and answered all my questions. Excellent maps, excellent service from Josh. Way to offer a great product & service! This is the best mapping tool I’ve used, and I went through a lot of them before discovering MapifyPro. And the customer support is outstanding and super fast to respond when I had my first and only issue. I highly recommend MapifyPro!! Thanks again Josh for the timely response and support. Nice plugin but support is far from what you would expect. Usually it takes them at least 2 days to take a first look at your ticket! Admin Reply: Sorry for the frustrations! We admittedly fell behind there for a while but are back in action and focusing on a better tech support experience. After trying a half dozen map location systems, including one that cost over $300, I finally found this one that works properly and the customer support time is a fraction of other software company’s turn around times. Thanks! Easily the best map plugin for wordpress – by far! We’ve researched map plugins for a month and finally chose MapifyPro after trying the demos, reading the reviews and scouring the internet over and over again. This thing does exactly what we want and much, much more – in actuality, it has us rethinking how we want to add maps to the site because there’s so much here to play with. Adding the plugin was a breeze and when we ran into a theme conflict, we were *blown away* by the level of support offered by the plugin’s creator. We have full confidence in our decision to go with MapifyPro! I looked for a map plugin for over 4 weeks—truly tried them all. Man, this is by far the best. The batch upload is what makes this–I had 255 locations to upload. Boom. Done in 2 hours, all I had to do was use batch geocode to find coordinates, plug into a CSV and it was good to go. Highly recommend! Mapify pro fits perfectly to my needs, I use it on several blogs and it works great. While installing mapify and adrift I faced several issues, some had to do with my provider, some with my lack in technical knowledge (I’m more on the creative side) and I got great support from Josh and Alkesh, thank you! On my wishlist: a sample of map pins, small enough that the map still readable. Excellent plugin, and a super responsive support. Excellent service, I highly recommend it. Un excellent plugin, et un support super réactif. Excellent service, je le recommande vivement. Fantastic plugin and incredible support! Couldn’t be happier with product. Support is instant and provides fantastic results. Ton of features and will definitely be purchasing more licenses in the future. Highly recommend. The support was awesome. I appreciated the patience and assistance that was provided. Oh, and the plugin rocks, too! The only thing I wish was integrated was an order feature. We ended up using an outside plugin to alphabetize locations and I would think that would be a fairly simple integration into the plugin. After researching online for a map plug-in that would serve my needs, MapifyPro had everything I was looking for! From the bundle of locations, to the pop-up of extra information, and the ability to customize many of the features, I was very happy with everything included in the plug-in. While I am not that tech savvy and did experience some slight frustrations, the MapifyPro team were able to support my site and ensure that we got the plug-in up and running. Great plug-in with a lot of potential for customizing your needs! Recommend it for sure! Probably the most full-featured map plugin around. After doing a lot of research I stumbled on Mapify and I couldn’t be happier. They are pretty consistently staying on top of bugs/updates, as well as ensuring compatibility with each new WordPress launch. I use the developer license as I have the plugin across several sites. They are still a fairly new plugin so there are features being added frequently and they seem to listen to requests. (I would still LOVE to see a ‘list ONLY’ feature– great for widgets, etc.) Overall for most people, there is way more features than you would need all of which are easy to customize to your specific needs. However, the true gold of this plugin is in their support. I had a conflict with the map with one or two of my plugins and they went way above and beyond to diagnose and fix the problem– they narrowed down what plugin(s) was causing the problems and PERSONALLY fixed the scripting errors on my site. (they didn’t just give me a canned response of ‘try disabling all plugins, etc.’ as most developers give) Truly blown away with the support! The best support for a plugin that I have ever received! Tried a number of different mapping plugins and never found one that worked well for what we need … a travel blog … until Mapify Pro. We are also a new user, but so far, installation, easy of use, features are all fantastic. Even our 3rd party web hosts who have recommended other mapping plug ins to us are so impressed by what they have seen us do in a short time, they commented “we have to take a really close look at Mapify now.” Just as importantly, the support and response provided by Josh has been superb. Wow! We are new to Mapify but we are very impressed so far. With other plugins, we’ve had problems plaguing our map objectives for more than a year. But the team at Mapify took our input seriously and worked hard to create a solution. They were responsive. They were capable. They got it done. We have finally found the program, and the support, we were looking for. This plugin is very easy to use and to configure, probably the best WordPress map plugin we can find in the market . The mapify team helped us with a top class support service. This is an excellent tool that allows so much customisation – brand, filters, icons….the list goes on. 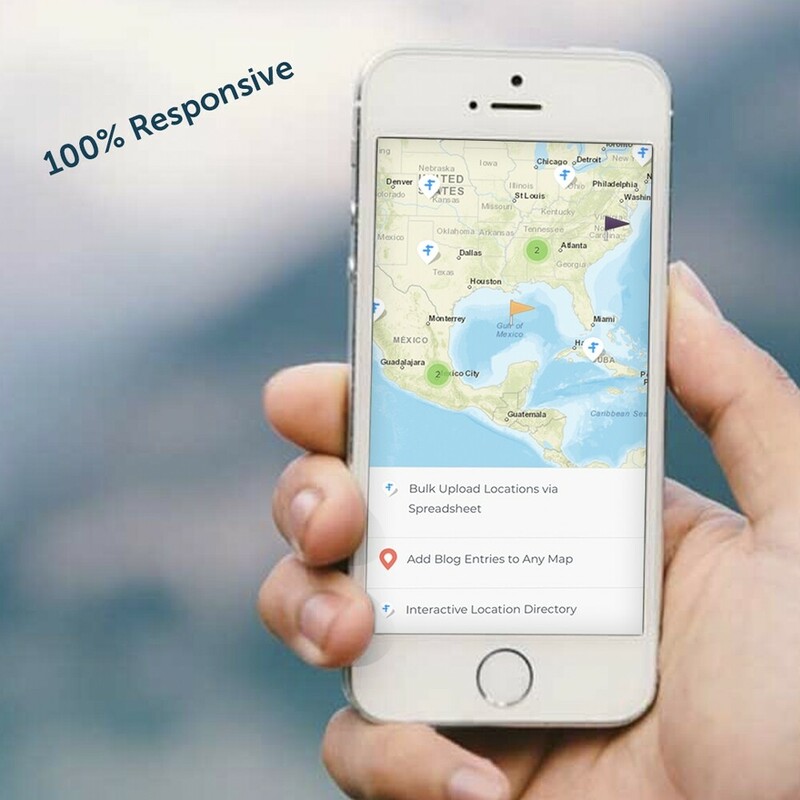 It’s easy to install, fully responsive and interacts with Google maps beautifully. The support is extremely helpful, too. This is really great plugin for any one that needs a simple way to add a more interactive map and Josh and his company are really great. I ran into a small obstacle that I couldn’t figure out, I opened a ticket, and within 20 minutes the support team helped me figure it out. I buy a lot of plugins and few sellers compare to Josh and his team’s performance. So if you have any reservations about buying this plugin, I would recommend you give it a shot, it can probably do exactly what you need, it’s very intuitive and had tons of options, I think they thought of everything. Excellent plugin and was worth every penny spent! I highly recommend! I was able to use the developer mapifypro to not only generate an interactive locations map, but to pull all the data from the map to create a separate listing below. They also have excellent support! We use MapifyPro for our commercial real estate website. For our purposes, it really is the best plugin out there. 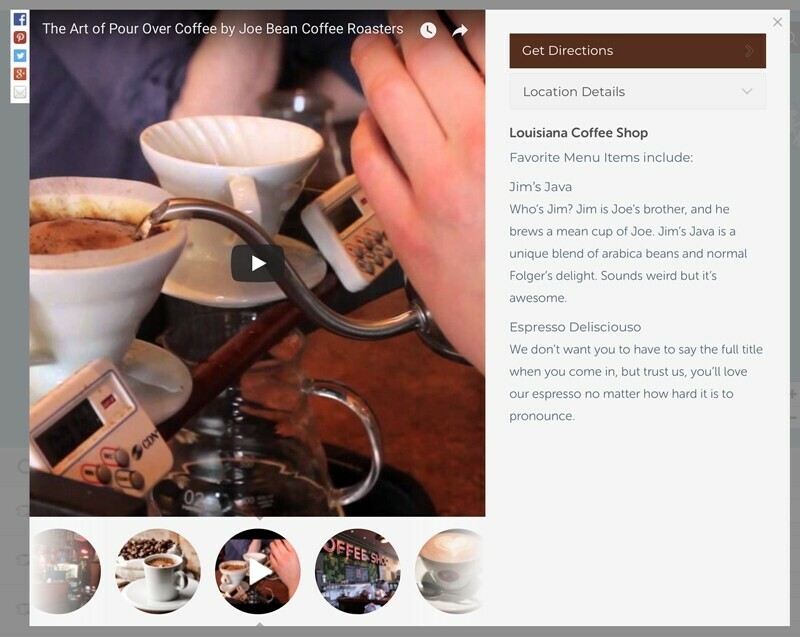 We like the popup that displays property descriptions, video, and links. Great product, great support. 5 stars! 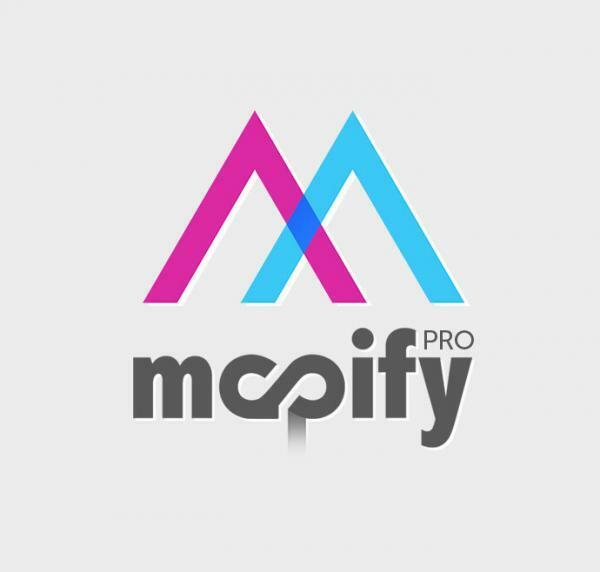 You can’t go wrong with MapifyPro. I’m using mapifypro for a tourist itineraries website… Great plug in (best I have found after many many tries) and best support ever! Amazing. Enough said. Everything and more you would want included in a map. Tried several map plugins before I found MapifyPro. I so wish this was the first one I came across because I wasted so much time on the the others. It does everything advertised perfectly and it is super easy to work with. Support is also very responsive. The only thing I would improve on in is the csv importer, but given all of the other features available here that is a drop in the bucket to what you can do with it. Highly recommended. The developers of MapifyPro are very professional. I had a conflict with the pop up not working with my template and permalinks. They responded very quickly and went right to work addressing the issue. They fixed it for me and I’m very happy with their work and custom satisfaction. With so many plugins out there it is very important to find a company that stand by their product and has great custom support. These guys get an A+ on that and I wish them great susses with their WordPress map plugin. Thank you so much! MapifyPro is the best mapping plugin I’ve found after trying many others. I first purchased a “Normal License” and have now upgraded to a “Developer License”. I’m now using MapifyPro on all my sites, including numerous event sites that map participating locations. It works great on mobile devices, plays well with other plugins, loads quickly, and has a lot of customization options. The latest update added lots of great features to an already great plugin. Support has been amazing – almost instantaneous – whenever I’ve had a question or issue. Absolutely phenomenal plugin, does so much magic with the GoogleMaps API its almost criminal. If you want to do anything with GoogleMaps on your WordPress website, use this plugin. The support was top notch too 🙂 A must buy for all WordPress Designers and Developers. MapifyPro is by FAR the sexiest map creator on the market, and there’s no better way for us to share our travels and entice viewers to spend more time on our site with increased click rates. This plugin has definitely amped up the look, the feel and the overall usability of our site! The plugin does exactly what it is supposed to, and when I had an issue Josh was incredibly fast at responding to my request and getting the work for what I needed it to. Two Thumbs up! Looks great as well! This plugin, along with Pretty Routes, is a perfect combination for my requirements. I’ve wanted a better mapping plugin that allows for more aesthetics in terms of map appearance. The plugin is becoming an integral part of several tourism and travel related projects I’m involved with and I anticipate using it for additional projects in the future. Response time for support has been outstanding and ideas for improving the plugin are also being taken into account! Not fully implemented yet, but you can see the plugin at work on my website here: http://www.alabamabyways.org. I’ve been wanting a plugin that could do what this plugin does for several years! Thanks! I have to say that besides loving the plugin, and being very easy to use by a non expert like me, I am very impressed with the support that I’ve received whenever I’ve encountered problems, always getting a reply within 24h. Good work! I don’t think there could be a better mapping plugin for WordPress. This baby does everything I can dream of and more! I even contacted support because of a conflict with my theme, and I got an IMMEDIATE response, which also happened to fix my issue very easily. I know I’ll be purchasing more licenses in the near future.